1903: Who Piloted the Wright Brothers’ First Flight? The Wright Brothers’ famous aircraft was made of lightweight spruce-wood (Picea sitchensis) and had two propeller-driven four-cylinder gasoline engines of 12 horsepower. Brothers Orville and Wilbur Wright from the city of Dayton, Ohio (where the Dayton Peace Agreement was signed) performed the first successful airplane flight on this day, using their Wright Flyer 1. Thus they achieved the first controlled and powered airplane flight in world history. The plane was made of lightweight spruce-wood (Picea sitchensis) and had two propeller-driven four-cylinder 12 horsepower gasoline engines. The empty aircraft weighed as much as 274 kg and the wing surface was 47 square meters. It could reach a speed of 48 kilometers per hour. The historic first flight was accomplished on sandy plains six kilometers from the town of Kitty Hawk (an American aircraft carrier is named precisely after this flight). 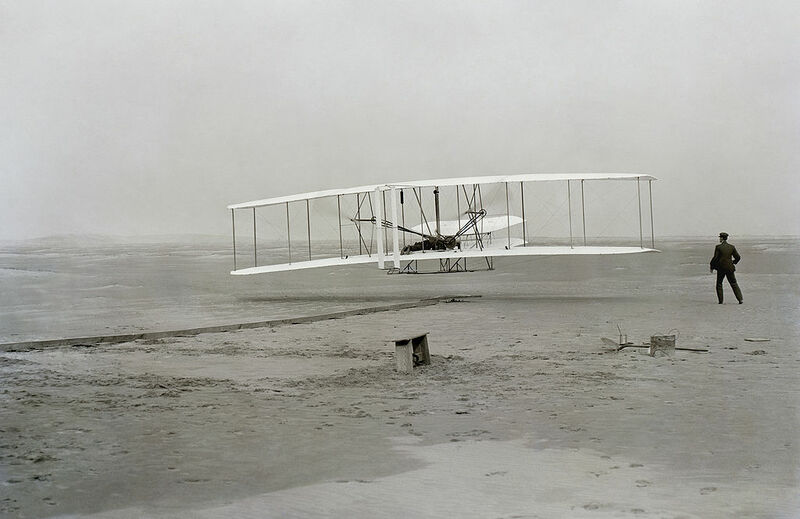 This first flight was piloted by the younger brother Orwille Wright, while Wilbur surveyed the flight from the ground.